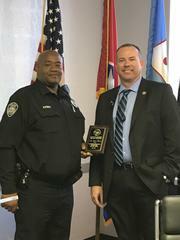 April "Employee of the Month" for the Jackson Police Department is Officer Avery. 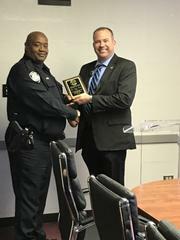 The Jackson Police Deparment elects Officer James Avery as "Employee of the Month" for the month of April. Officer Avery, who is assigned to the Patrol Division, has fifteen years of service with the Jackson Police Department. Officer Avery is a friendly officer who possesses a great personality. Though he enjoys joking around with his co-workers, he is a very professional officer. Officer Avery exercises the Community Oriented Policing concept. It is witnessed through his relationship with the citizens in his area. Officer Avery is also an Accident Scene Technician who can be depended upon to go above and beyond what is required of him. Recently, an unresponsive victim's life was saved because of Officer Avery's assistance. Officer Avery is the department's very own "Superstar." His face is plastered on billboards and commercials because he is a spokesperson for the Lift Weight Management program. Officer Avery is a member of Pilgrim Rest Church. He and his lovely wife have four children and three grandchildren. In his spare time, he drives buses and operates a trucking business with his eldest son.